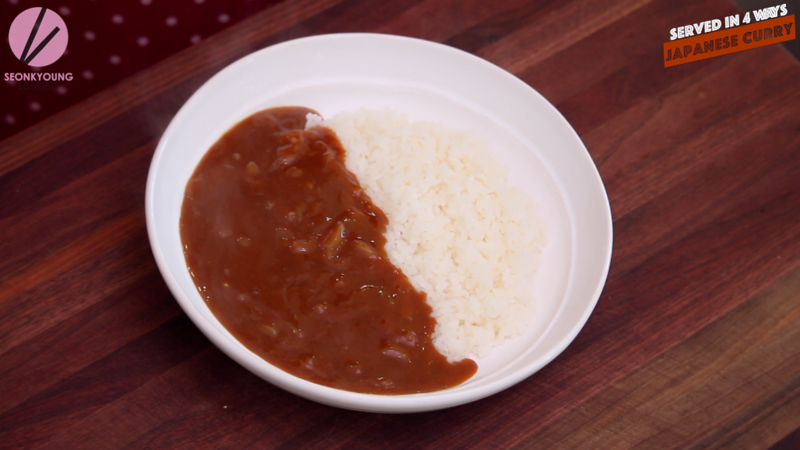 Today, let’s make some Japanese Curry! 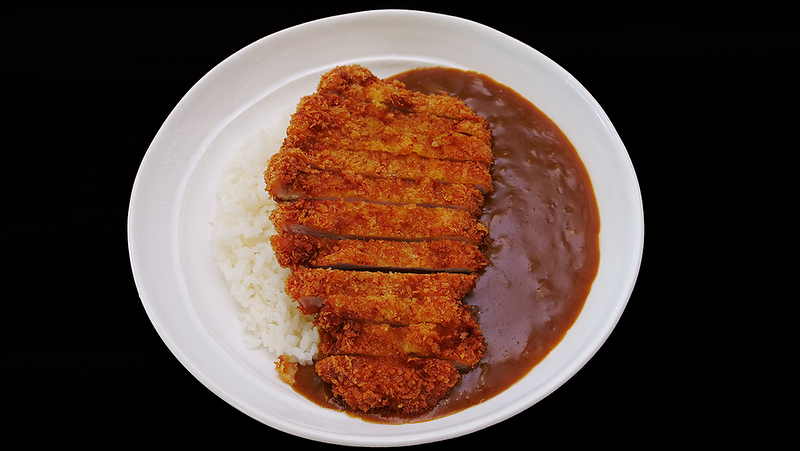 When my hubby and I went to Japan, we had to stop by at Coco Curry, it’t fast Japanese curry restaurant! 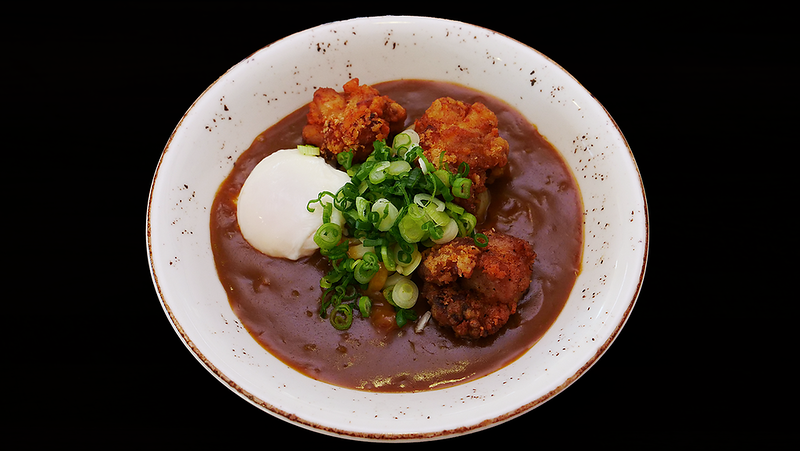 Japanese curry is something different, something special. 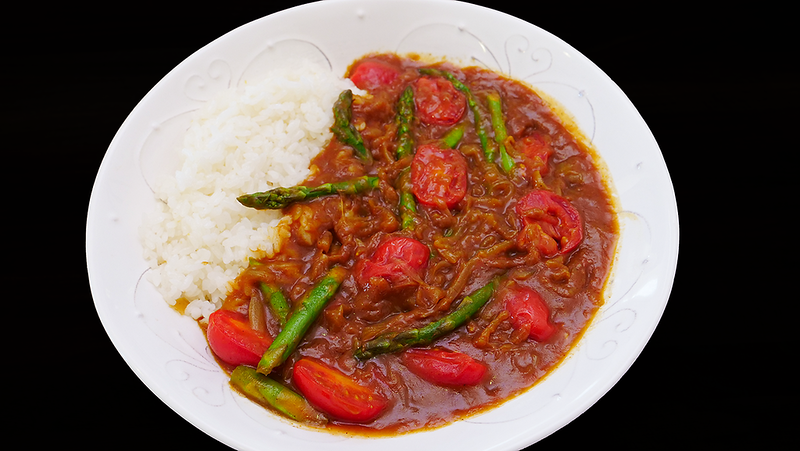 Especially Coco curry, it’s a bit different than Japanese home style curry. They have curry base and the customers choose the meat and veggies. 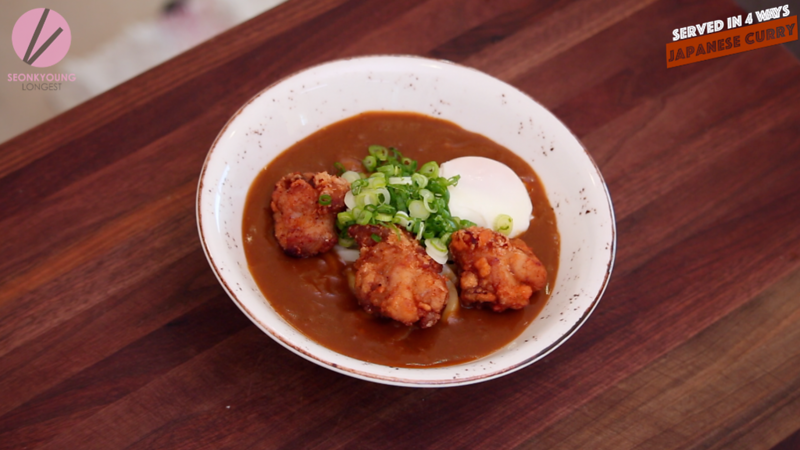 I inspired my Japanese curry recipe from Coco Curry. First thing is first, let’s make the curry base! 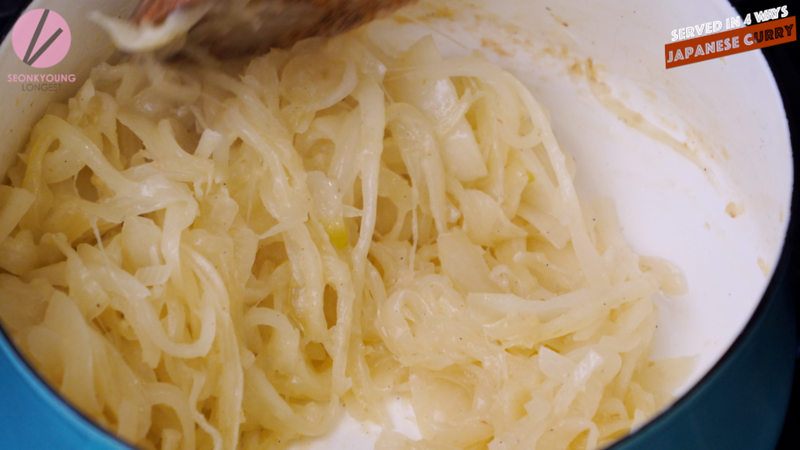 We’re starting from melting butter… and add thinly sliced onion, grated garlic, ginger, salt and pepper. Yes, we are caramelizing the onion! 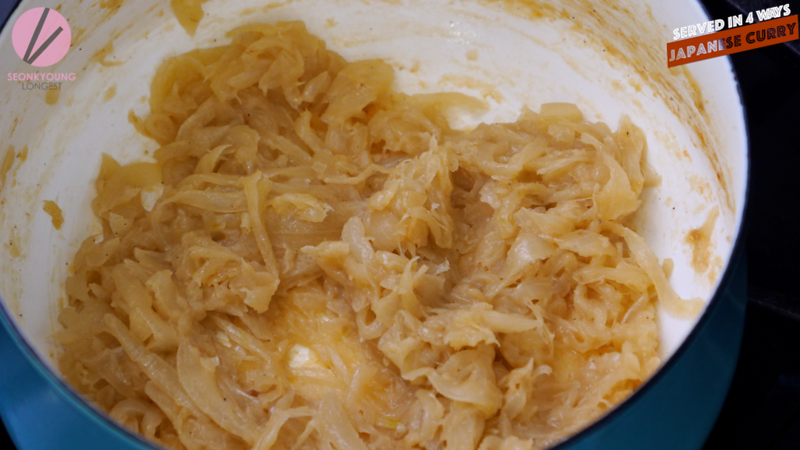 Let the onion caramelize for 25 minutes or longer until it’s soft, tender and light yellow-ish brown color. We’re not trying to make French onion soup here, so don’t worry the onion looks mush or not as dark brown. Stir occasionally, especially when it start stick on to the bottom. 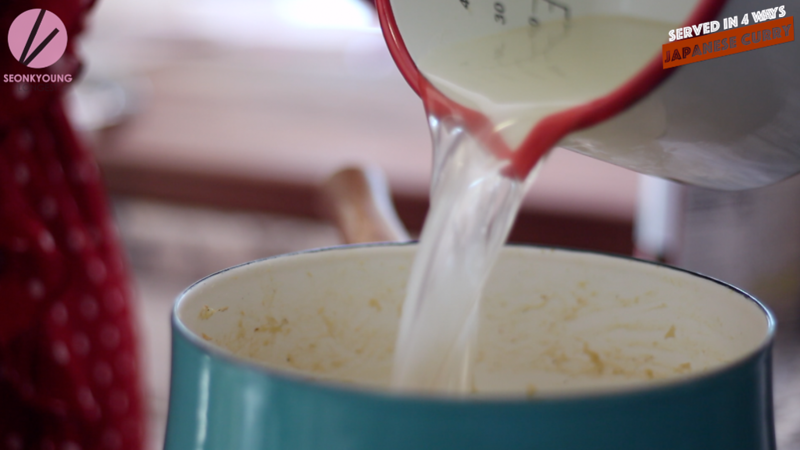 Meanwhile, mix water, chicken stock and sake; pour to the pot. 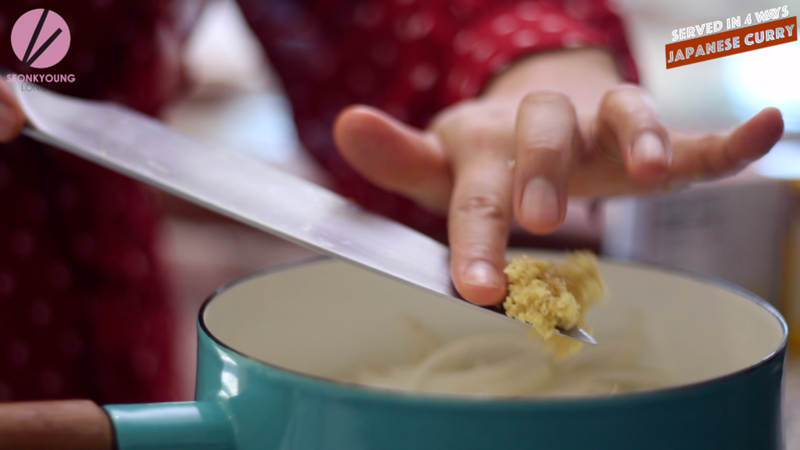 Scraping the bottom of the pot using an wooden spoon. 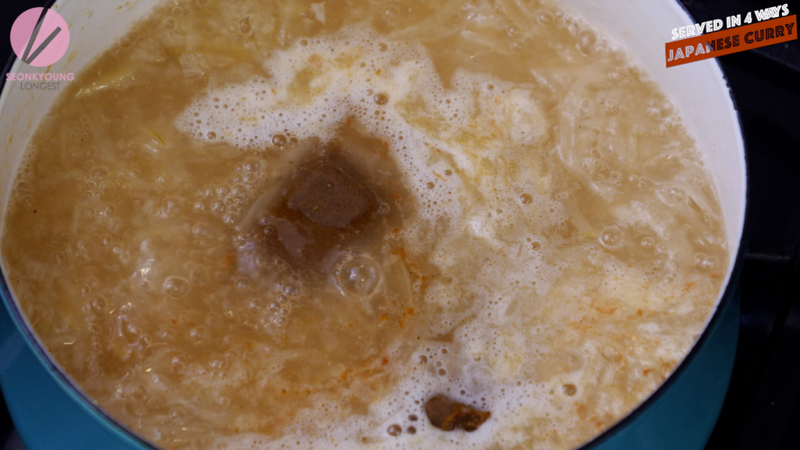 Bring soup to boil over high heat. 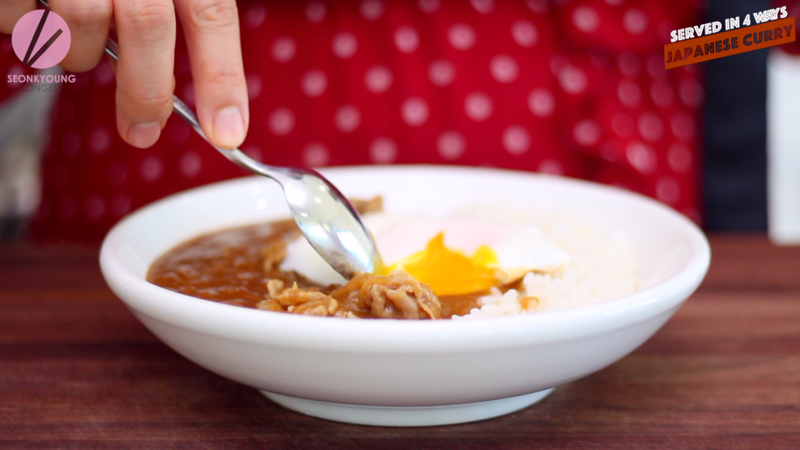 Meanwhile, let’s talk about the Japanese curry. 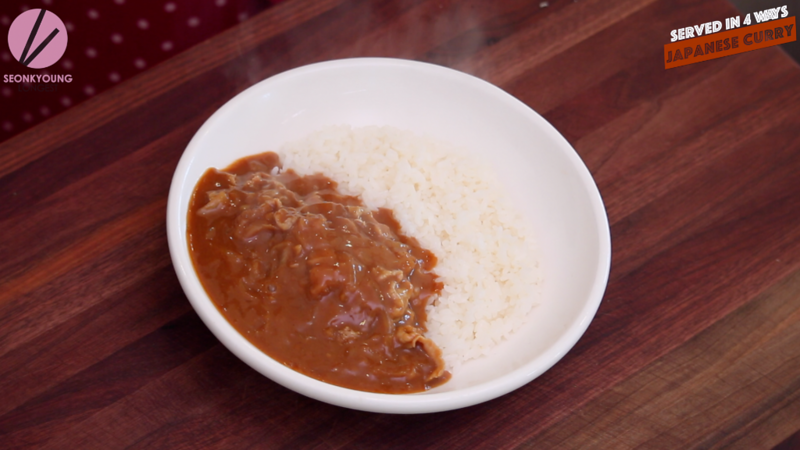 You could make Japanese curry form scratch, but it takes way too much time and ingredients, to me it doesn’t make sense. One of the other (time consuming or too many ingredients) I can take, but not both together. So, I LOVE using curry paste and Japanese curry paste is freaking delicious!! 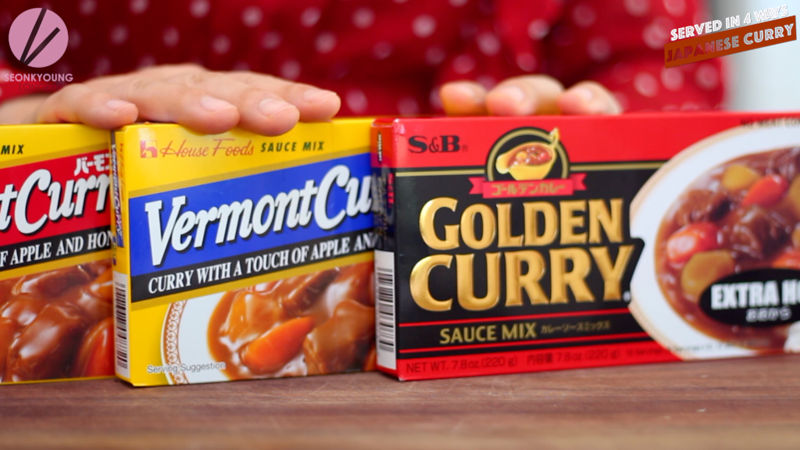 My favorite brand is Vermont Curry and Golden Curry. They both are great taste, texture and flavors. I have used all of them, and they are all delicious! Just remember, Japanese “hot” or “spicy” is really not as bad as other Asian country’s take on spicy level. Break the curry blocks and add direct into the pot. 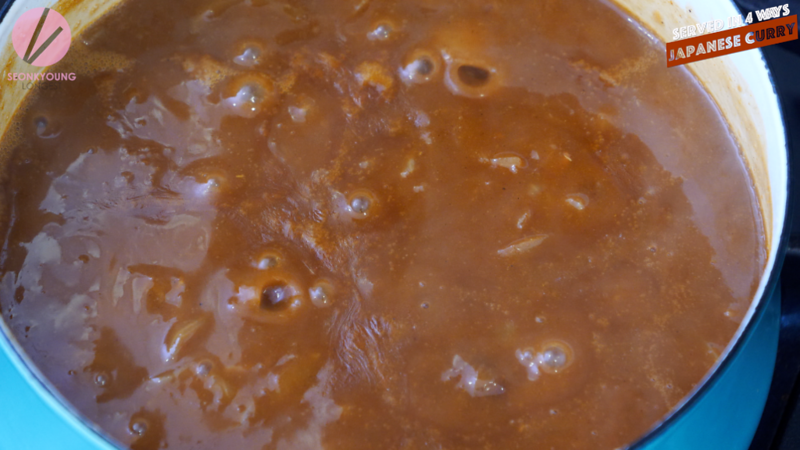 Stir so Japanese curry blocks will dissolve to the liquid. Now, it’s ready to serve as you wish with your choice of starch, protein & veggies!! First, let’s make ShabuShabu Pork Curry! Bring 1 portion of curry base to simmer, add shabushabu pork pieces one by one, just like you are doing shabushabu (Japanese hot pot). Simmer for 2 to 3 minutes or until the pork is fully cooked. 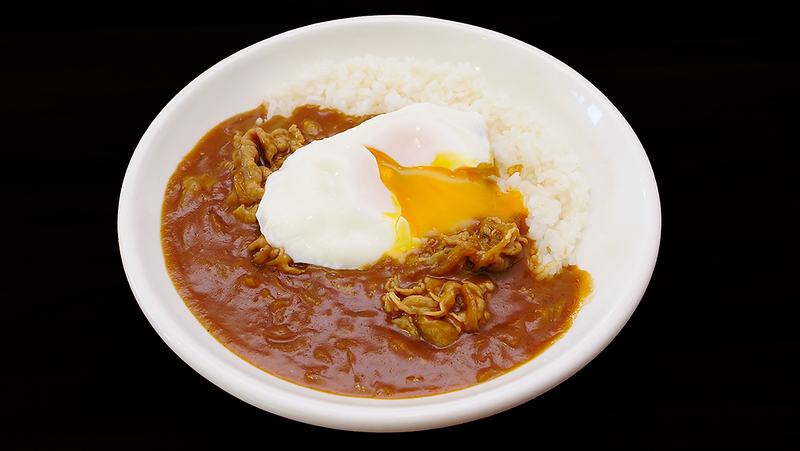 Serve over warm cooked rice along with poached egg. 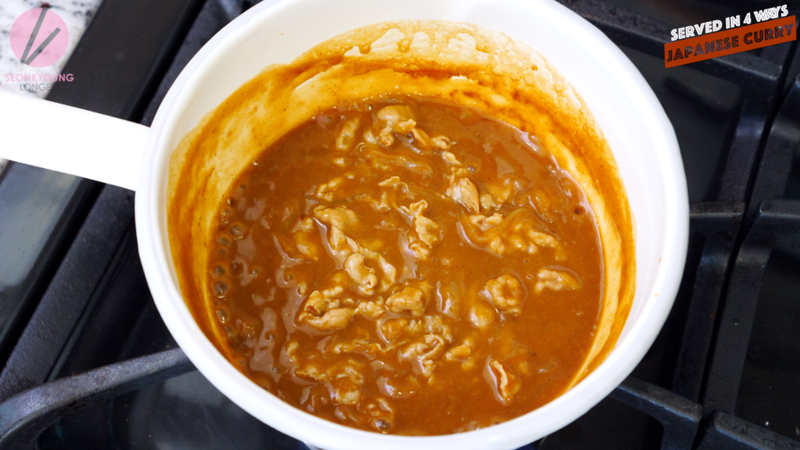 Bring curry base to simmer. 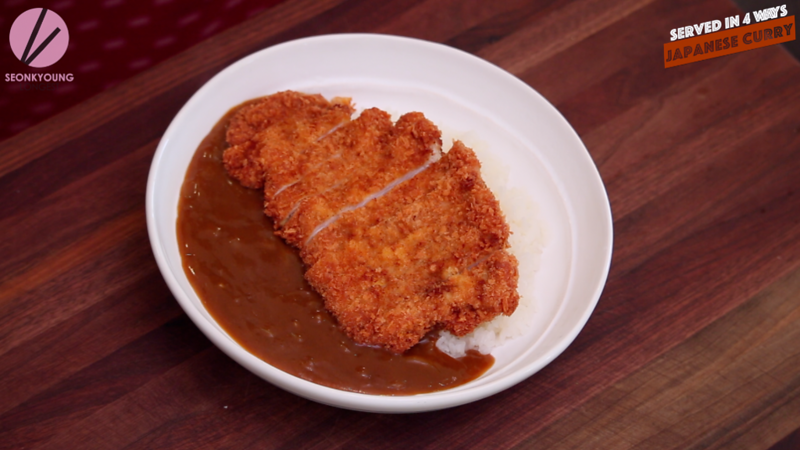 Serve over warm cooked rice and top with tonkatsu. Tonkatsu is pork cutlet in Japanese. 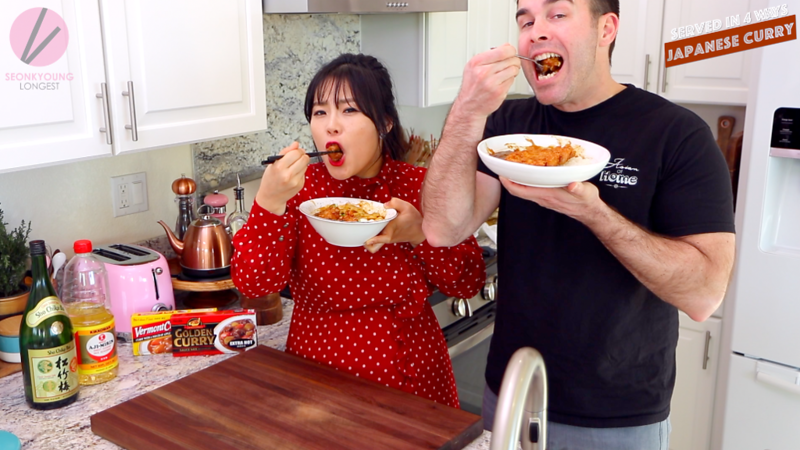 Super simple to make, check out my Korean style Tonktsu recipe! 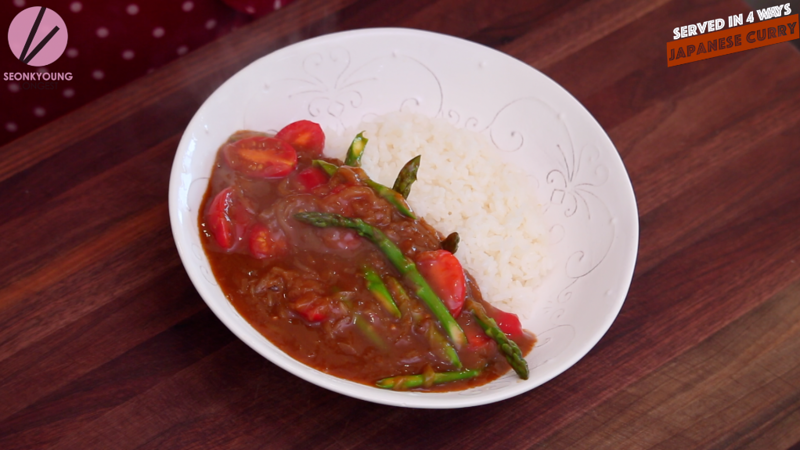 Third, Asparagus & Tomato Curry! 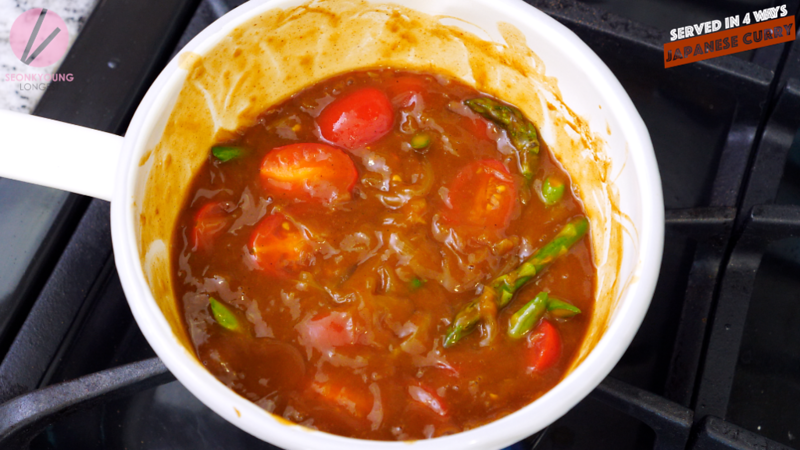 Bring 1 portion of curry base to simmer, add asparagus and tomato. Let it simmer for 2 to 3 minutes or until the vegetables are cooked to your taste. Serve over warm cooked rice! 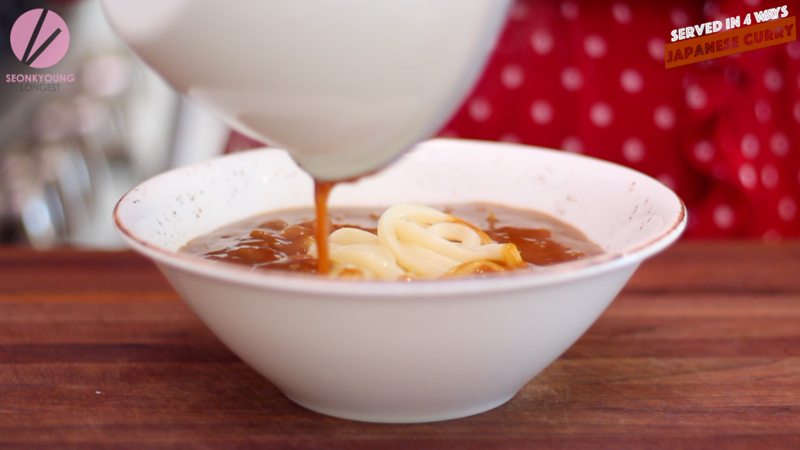 Yes, you can serve Japanese curry over udon!! Bring 1 portion of curry base to simmer. 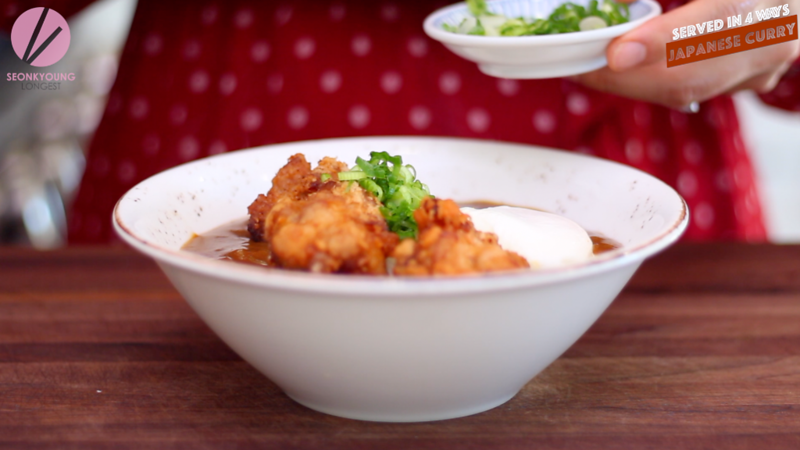 Serve over warm cooked udon noodles and top with karaage, poached egg and chopped green onion. Enjoy! Check out my Karaage recipe! Perfect snack that can go on top of rice, noodles, bento box and more! 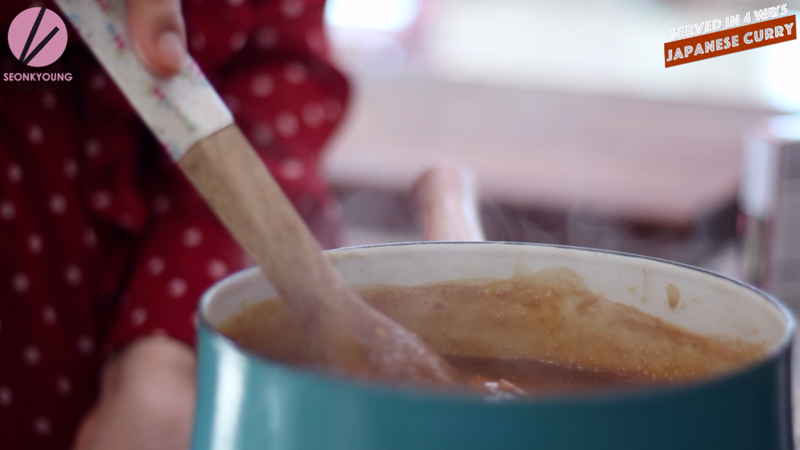 Heat a medium size pot to over medium low heat; add butter and let it melt completely. Add onion, garlic, ginger, salt and pepper and stir. Let the onion caramelize for 25 minutes or longer until it’s soft, tender and light yellow-ish brown color. Stir occasionally, especially when it start stick on to the bottom. 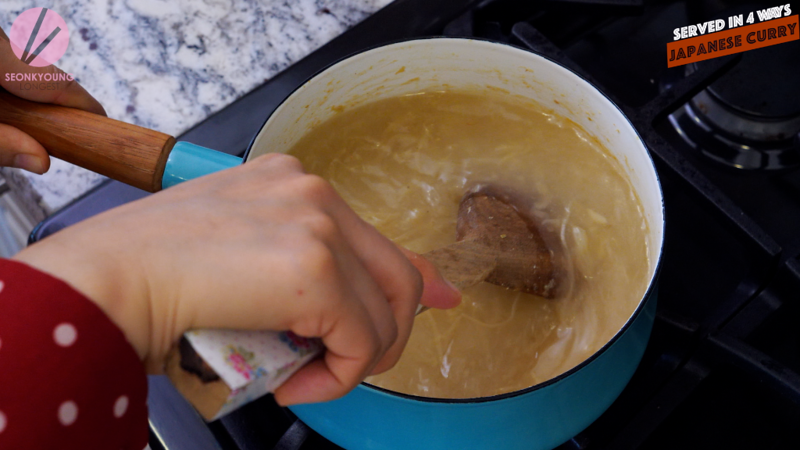 Bring soup to boil over high heat; add Japanese curry blocks direct into the pot. 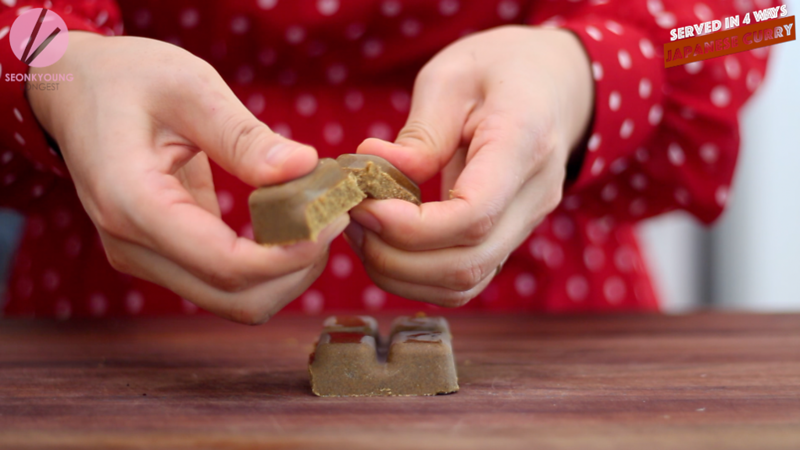 Stir so Japanese curry blocks will dissolve to the liquid. Reduce heat to medium low and simmer for 5 minutes. Now, it’s ready to serve as you wish with your choice of starch, protein & veggies!! 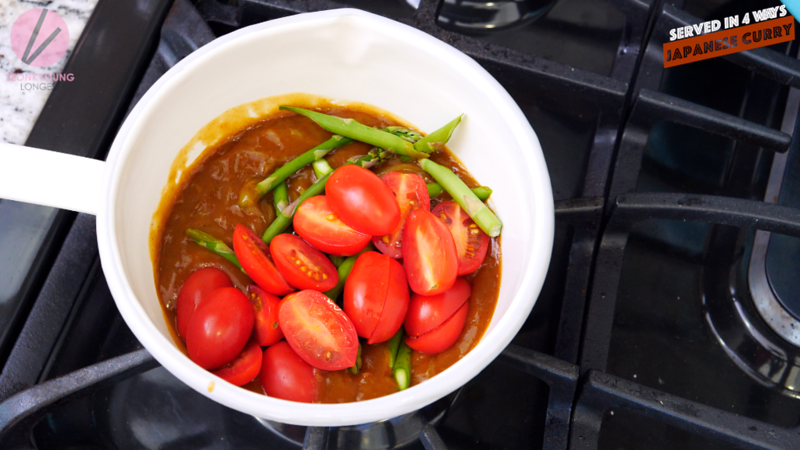 Bring curry base to simmer, add asparagus and tomato. Simmer for 2 to 3 minutes or until the vegetables are cooked to your taste. Serve over warm cooked rice. 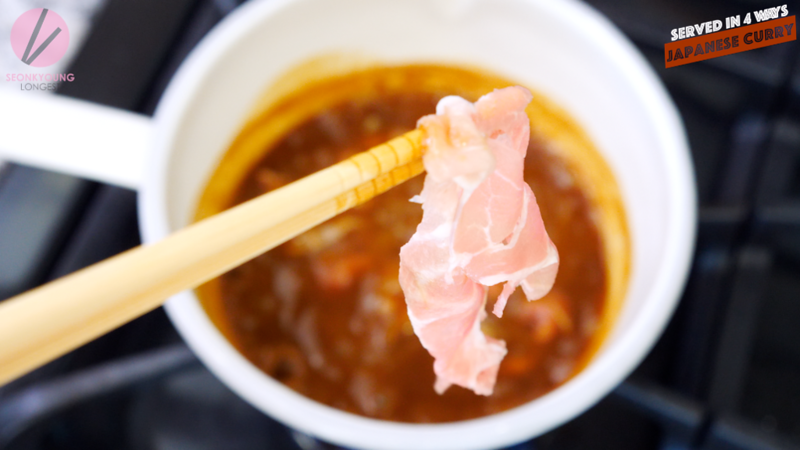 Bring curry base to simmer, add shabushabu pork pieces one by one, just like you are doing shabushabu (Japanese hot pot). Simmer for 2 to 3 minutes or until the pork is fully cooked. Serve over warm cooked rice along with poached egg. Bring curry base to simmer. 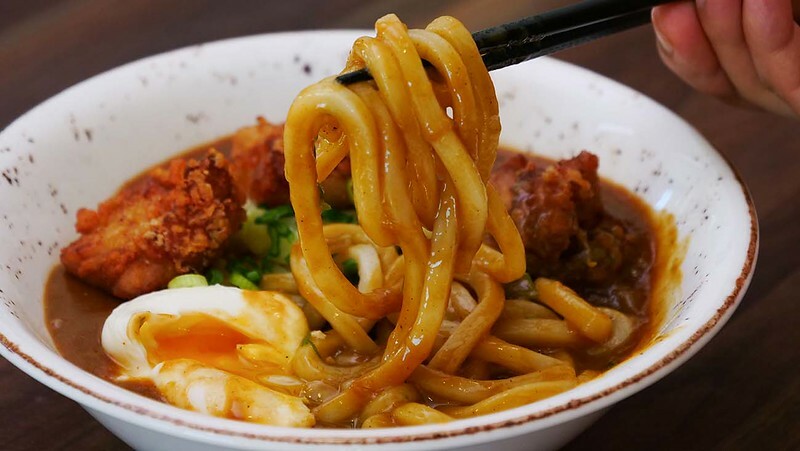 Serve over warm cooked udon noodles and top with karaage, poached egg and chopped green onion. Enjoy! Thank you so much! Cooked a little panko chicken to go with it; This curry was so good!